Donald Troester, age 92, of Aurora, passed away Tuesday, January 2, 2018, at the Hamilton Manor. Funeral Services will be held 10:30 A.M., Saturday, January 6th at St. Peter Lutheran Church in Hampton. Rev. Jim Gruber will officiate. Interment will be at Salem Lutheran Church Cemetery. Visitation with family will be from 5 - 7 P.M. Friday at St. Peter Lutheran Church, 381 H Street, Hampton. In lieu of flowers, memorials may be made to St. Peter Lutheran Church or Hampton Lutheran School. Higby-McQuiston Mortuary is in charge of arrangements. Condolences may be e-mailed to the family through the mortuary website at www.higbymortuary.com. 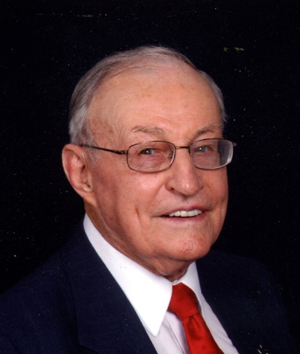 Donald William Troester, the son of William C. and Anna (Bamesberger) Troester, was born on the family farm in Hamilton County, Nebraska on September 27, 1925 and passed away in Aurora, Nebraska on January 2, 2018, at the age of 92. Don was baptized into the Lutheran Faith on October 25, 1925 and confirmed on May 21, 1939 at Salem Lutheran Church southwest of Hampton. Don grew up on the family farm and was on the 1942 Hampton High School State Championship Basketball Team. He graduated from Hampton High School in 1943. Don served in the U.S. Army during WW II, first at Camp Crowder, Missouri and then Fort Monmouth New Jersey for a year before being honorably discharged in December 1946. After returning home he began farming with his father in 1947 and continued farming until retiring in 1992. Don was united in marriage to Norma Marie Tonniges on March 11, 1951 at St. Peter Lutheran Church at Gresham, Nebraska. They lived in Uncle Abe’s brick retirement home for one year, before they moved to their own home to raise their family until retirement. Don and Norma built a home in Aurora “to grow old in.” The farm home has become Tim’s family home. Don was a member of St. Peter Lutheran Church and was always active in church activities. He loved being Sunday School Superintendent for 126 children in the 1960’s. He loved being head usher and greeting people for a number of years, member of church council and other boards. Don was a charter member of the Hampton Lion’s Club. Don was an avid bowler, dart-baller and Boston Red Sox baseball fan. Don loved to travel with Norma in the U.S. and overseas. He enjoyed going out to the farm and especially driving the combine. Don experienced farming with horses as a youngster and was also fortunate enough to drive a tractor with GPS (John Deere of course.) He loved his children, grandchildren and great-grandchildren. Don & Norma really enjoyed going to Spring & Fall L.L.L. Rallies. He was preceded in death by his parents; brother, Ken and sister and brother-in-law, Ruth and Ed George. Those left to cherish his memory as Don celebrates Heaven with Jesus who won the victory over death are his wife of 66 years, Norma of Aurora; 5 children, Rebecca (Ken) Fick of Racine, Wisconsin, Dan (Tanita) Troester of York, Dean (Lisa) Troester of Lincoln, Teresa (Larry) Friesen of Hampton and Tim (Monica) Troester of Hampton; son-in-law, LeRoy Klipp of Hampton; daughter-in-law, Barb (Jim) Mack of Lincoln; daughter-in-law, Sue (Dale) Klein of Pleasanton, and daughter-in-law, Linda Troester of Hampton; 14 grandchildren, Joel (Maggie) Troester, Mindi Troester, Alex Troester, Daniela (Shane) Wilson, Nick Fick, Clinton Fick, Clarissa (Jason) Braun, Ben (Anna) Troester, Adam (Kirsten) Troester, Greg (Kristina) Klipp, Tim (Joseph) Klipp, Jon (Morgan) Klipp, Jaime Troester and Micah Troester and 16 great-grandchildren, Hailey, Maxx & Libby Troester, Hayden Klipp, Tinsley & Hudson Klipp, Riley Troester, Hannah & Parker Herian, Audrey & Michael Wilson, Nina Fick, Savannah & Liliana Braun, Jameson & Preston Troester . He is also survived by his brother, Jerry (Bev) Troester of Chesterfield, Missouri and sister-in-law, Gretchen Troester of Hampton and many other relatives and friends.